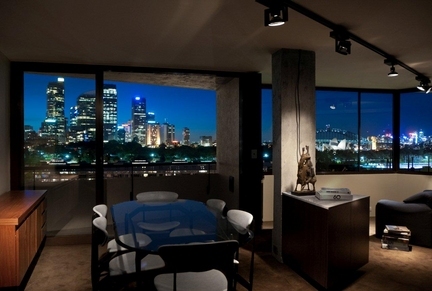 Commanding the quintessential Sydney view, Potts Point View apartment literally adds art to life as the city skyline forms a dramatic backdrop to every room, taking in the Harbour Bridge, Opera House, Luna Park, the CBD and North Sydney neon. The misé-en-scene speaks emotion and conceptual glamour-dazzling by day, scintillating by night. The one bedroom apartment was renovated and a wall eliminated to maximise space, the resulting oversized studio, now boasts knock out views from every room. With an art directed interior and furnished with the most desirable Australian (Grant Featherston, Artes Studio) and international (Vico Magistretti for Cassina) mid century design, Potts Point View will be appreciated by the lovers of understated style. Discreetly positioned in a 70s architectural mid rise-attributed to Australian Modernist Ian McKay, The apartment is perched on the escarpment at the end of a quiet cul-de-sac in the desirable precinct of St Neots Ave, the Paris end of Potts Point's café strip. $485 per night for 2-4 nights. $385 per night for 5 nights plus. Minimum stay 2 nights. 1 and 2 week minimums for Christmas and New Year period (price on application). Contact us for long stay.